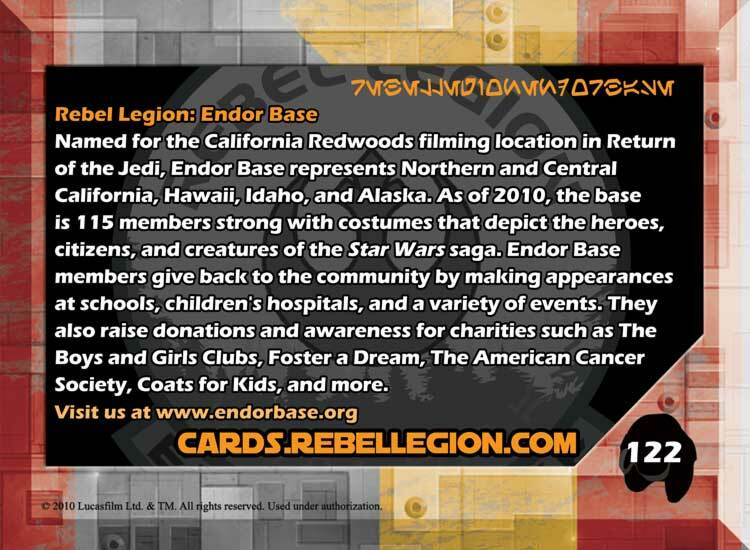 Rebel Legion :: View topic - Sign-up: Series III trading cards - "Endor Base"
Sign-up: Series III trading cards - "Endor Base"
Posted: Sun Apr 11, 2010 7:37 am Post subject: Sign-up: Series III trading cards - "Endor Base"
Thanks to everyone for voting your opinion about the trading cards. Good news, we will be having 2 group trading cards in series III since there were quite a few drop-outs! We will still be having our originally planned "WonderCon 2009" trading card featuring all the RL members who were at the 2009 photo shoot. 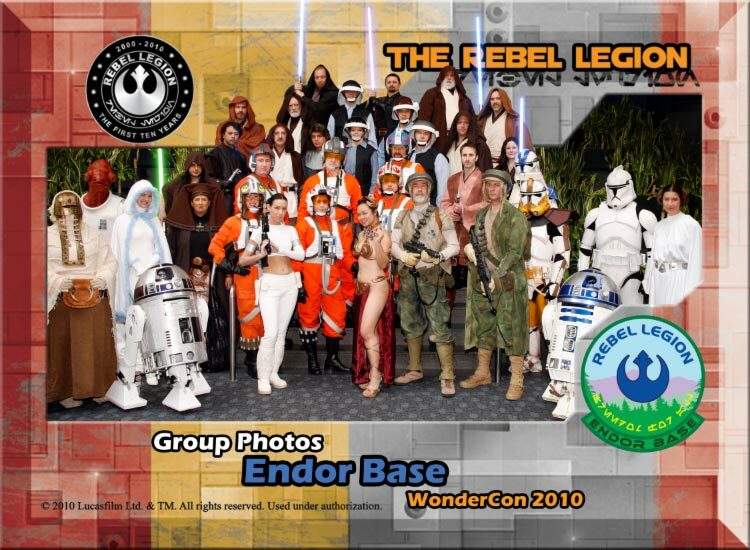 We will also be having an "Endor Base" 2010 group card specifically to promote Endor Base... using the group photo from WonderCon this year. We can sell up to 20 'shares' of this card to Endor Base members. If we sell all 20 shares, the cost is $5.00 for 100 cards. If we only sold, 14 shares (which is fine) then the price would be $7.15 for 142 cards, and so on. This price does not include paypal fess or fees to ship the cards to any of you (I'd calculate shipping and charge for that when the cards came in). If you'd like to purchase a share to donate back to the base for convention hand outs please indicate this. Thanks. I kind of hate to take this photo/card off of the series III group list by replacing it with the new photo from 2010 because there are some people in the 2009 photo who couldn't make it to the 2010 photo shoot. FYI, there is a slight chance if one of the group cards in Series 4 backs out we can have their spot and our card would be made much sooner (I think they are planning to do series 4 just after series 3 this year, or at the same time if they have enough artists). So that could mean we could have a one photo in series III (WonderCon 2009 card) and the other photo could wind up in Series IV (Endor Base 2010 - wondercon) which is going to be made either at the same time as Series III or just after Series III at the end of the year. I'm thinking to leave well enough alone and add the new photo to series five. Personally I like the new photo better, but to replace it over the '09 one is rather unfair, and I like seeing the year to year differences. Kathy, I'm assuming this poll will be over by May 1st, since that's the deadline for Series 3 pictures and text? Haven't had time to decide on the poll end date, the forum crashed again last night before I had a chance to refine anything like that. It would probably end well before May 1st so I have time to create the appropriate text to reflect the card. FYI, there is a slight chance if one of the group cards in Series 4 backs out we can have their spot and our card would be made much sooner (I think they are planning to do series 4 just after series 3 this year, or at the same time if they have enough artists). So that could mean we could have a one photo in series III (WonderCon 2008 card) and the other photo could wind up in Series IV (Endor Base 2010 - wondercon) which is going to be made either at the same time as Series III or just after Series III at the end of the year. I am for leaving the 2009 card in Series III and add the 2010 card to series 4 or 5 which ever you can get it in to. I would buy a share for both. OK - good news! There were so many drop-outs on the trading card runs that we can have our Endor Base card (2010 photo shoot) plus our WonderCon 2009 card both in the series 3 run! So since we have at least 8 people willing to get both cards we can make this a go. I'll send in our payment place holder now and work on collecting payment from everyone soon. We have to come up with the text for each card and submit it to the trading card team by the end of this month, so I'll start working on drafts and post them for discussion. We have so many members now, I think we have to skip putting our member names on the back. It would take up the entire card. Put me down for two shares (one back to the base). Just shot me a pm with how much I owe and when you need the credits. Yes, our Group Endor Card got bumped all the way from series 5 to series 3 so we will have two cards in series 3. 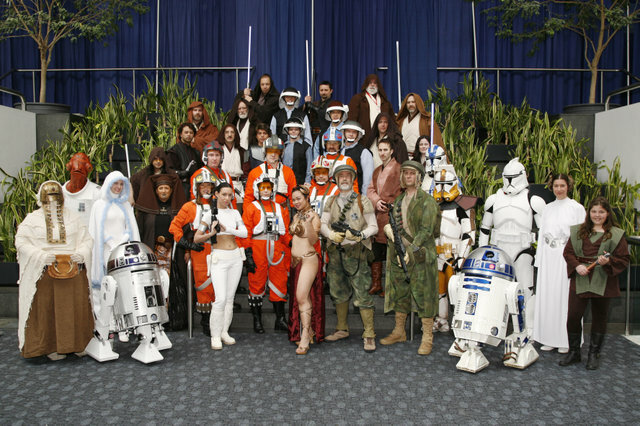 (WonderCon, and Endor Base). I'll keep the sign ups open a little longer for both cards, make a final ''last chance" post and then collect payment. I have 3 group cards I paid for in advance so I don't want to wait until CV to get the payments back. Would rather take care of it within a month. I think you already have me down for one (1) share of the 2009 trading card. Please also add me down for (1) share for the 2010 trading card. Sorry, I really lost track of time. We need to get our Card text in by May 1st with our photo! Here's what I've come up with. We have too many members now to list them all on the card this year, so I tried to include more helpful promotional information about our Base. Any edits or anything you think I've left out, I welcome the editing help and opinions! Endor Base, named for the California Redwoods filming location in Return of the Jedi, represents Northern and Central California, Hawaii, Idaho, and Alaska. 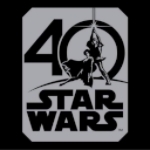 As of 2010, the base is 115 members strong with members representing hero characters and creatures from the Star Wars saga including Jedi, Rebel Troopers, Pilots, Tusken Raiders, Clone Troopers and Royalty. 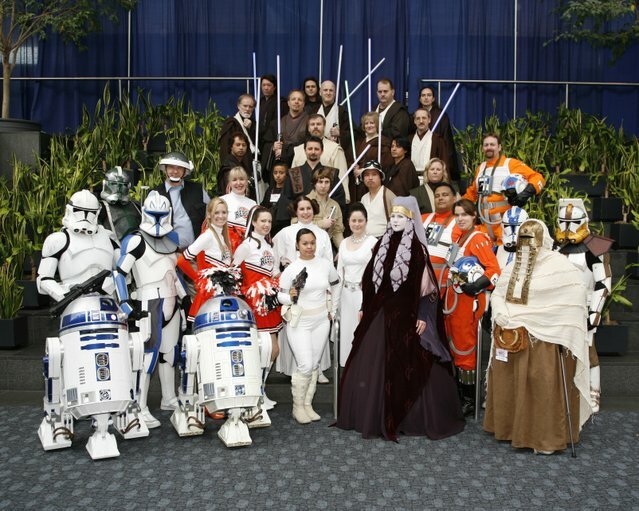 During their spare time, Endor Base members give back to the community by making appearances at schools, children’s hospitals, and a variety of events. They also raise donations and awareness for charities such as The Boys and Girls Clubs, Foster a Dream, The American Cancer Society, Coats for Kids, and more. Kathy, the text sounds good to me! OK, ionicdesigns has been really great about working on our trading cards for us. I think we have the design and text finalized (after just a few little revisions) and I wanted you to all look it over before he submits it officially to Justin who is heading up the trading card run. You'll notice that Tom's lightsaber is off. Tom's needs to stay off, because the blade was going to cover his face. The proof above is how his saber would look if it were on. So I just need to let ionicdesigns know if he should change it to be on. I personally lean toward off, but it's our base card and I don't want to make a demand out of it if you all feel differently. Proof 2 looks way better than Proof 1. I don't like the embossed background. It doesn't look at clean. Also, I noticed some cards have the embossed looks and other don't. Should pick one way or the other for all the cards.